Janine Hasey, UCCE Farm Advisor, Sutter/Yuba/Colusa Counties; Greg Browne, USDA Plant Pathologist, UC Davis; Astrid Volder, Plant Sciences, UC Davis; and Bruce Lampinen, UCCE Walnut Specialist, UC Davis. 2017 brought us unprecedented high and fluctuating water flows in the Sacramento and Feather Rivers, damaging orchards from direct flooding and indirectly via under-levee seepage. Many trees had a long exposure to waterlogged conditions through the winter and spring. We responded by sampling seepage, river water, and trunk cankers for Phytophthora, sampling roots in a waterlogged young orchard, and observing conditions where trees died or survived. This season we expect to see effects from last year’s flooding in several orchards. This article details our observations and research on survival, disease, and recovery. Please also read our previous flood articles written throughout 2017. Dormant trees often survive winter flooding due to low soil temperatures, low root respiration, cold water, and a lack of active roots. Walnut root activity begins about a month after leaf out, which is in May for Chandler, and peaks in the summer. Last year, however, many orchards were still flooded into May or even longer. Thousands of trees died as a result of waterlogging (“anoxia”, meaning lack of oxygen), mainly next to the levees, but many trees survived. Why? In many cases, temperature or continued water movement maintained high enough levels of oxygen in the water that roots could still survive. Except for low areas and swales where stagnate water remained into summer, the water was cold. Cold water holds more oxygen than warm water and oxygen is essential to generate energy and growth in roots. Also, orchards in river bottoms and near rivers where seepage occurred are often on lighter sandy or sandy loam soils and oxygen diffuses more readily through lighter soils compared to clay soils. Additionally, water moving as a result of river flow, pumping, or trenching tends to contain more oxygen than stagnant water, thereby enabling tree survival. Survival rate was poor where the water table was still close to the surface at the end of summer. Shoots from adventitious buds were seen in late June continuing through the summer/ fall on many waterlogged trees. These latent buds sprout when needed from trunks, limbs, or roots. Trees with vigorous shoot growth from these buds especially in the lower limb/upper trunk area in late summer/fall often have the best chance of survival the year after flooding. (see last section). Our approach was to study two potential problems of concern: 1) diseases caused by Phytophthora and 2) impact of waterlogging (anoxia) on the root system. 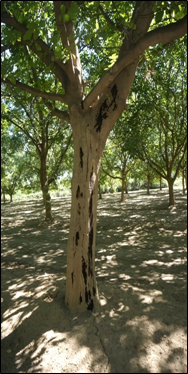 2017 Phytophthora results in the Feather River bottoms where walnut trees were partially submerged for prolonged periods. Water sampling: Since we know the “water mold” Phytophthora is found in surface water and infested soils, we sampled water in the Sacramento and Feather Rivers, in swales of standing flood water in the Feather River bottoms, and in seepage water from under levees along both rivers for the presence of Phytophthora in May 2017. High-throughput sequencing of DNA extracted from the water samples will be used to detect and identify species of Phytophthora present in the water (in progress). Tree trunk and rootstock samples: We isolated Phytophthora citricola and gonapodyides from bleeding rootstock and aerial trunk cankers sampled in mid-May and August (Photos 1 & 2). Trees differed in severity of infection with some almost girdled by cankers. Last fall, the crowns of most infected trees still looked fine but we will monitor these sites for declining trees through the summer to determine how damaging this disease will be. Photo 1: Bleeding cankers associated with aerial Phytophthora on a river bottom walnut tree (August 2017). 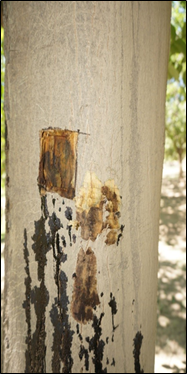 Photo 2: Bleeding canker associated with aerial Phytophthora on a river bottom walnut tree (August 2017). Impact of long-term (January to early May) waterlogging (anoxia or oxygen starvation) from continued seepage on walnut root health. Root sampling in a fourth leaf Chandler orchard on RX1 rootstock: Some flooded Chandler trees leafed out about a month later while most failed to push by the end of June when roots were sampled using soil cores. However, RX1 rootstocks with failed grafts were growing vigorously. Standing water was only 25 inches below the soil surface. 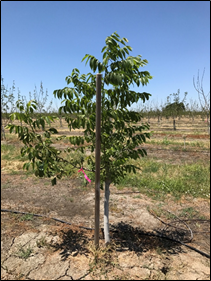 Soil cores to 20 inches depth were taken by Chandler trees on higher ground outside the seepage zone, as well as Chandler trees that had failed to push and ungrafted trees with pushing rootstock, both in the seepage zone (Photos 3-5). Photo 3. 4th leaf Chandler on RX1. Soil cores collected on June 29, 2017 found standing water at 25″ soil depth. This tree was located on higher ground. Photo: A. Volder. Photo 4. 4th leaf Chandler on RX1. Soil cores collected on June 29, 2017 found standing water at 25″ soil depth. This tree in the seepage zone failed to push. Photo: A. Volder. Photo 5. RX1 rootstock with a failed graft. Soil cores collected on June 29, 2017 found standing water at 25″ soil depth. The rootstock grew vigorously despite location in the seepage zone. Photo: A. Volder. Chandler-grafted trees that were in the seepage water zone did not push and had much lower standing root length (root length per volume of soil) than Chandler trees on higher ground. These seepage zone Chandler trees also had much greater average root diameter, suggesting that fine roots had either not been produced or had decayed. In contrast, rootstocks with a failed graft located in the seepage zone had greater standing root length than Chandler trees on the higher ground. 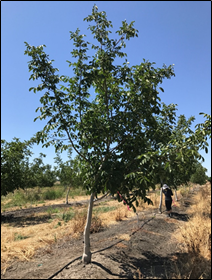 Below 8 inches soil depth, these rootstock-only trees in the seepage area had similar standing root length as the Chandler trees on higher ground, but they had much greater standing root length at the shallower 0-8-inch depth. 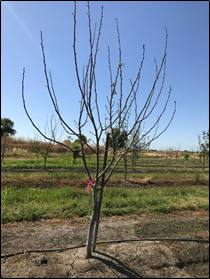 These data indicate that more research is needed on the resistance of different rootstocks under waterlogged conditions.